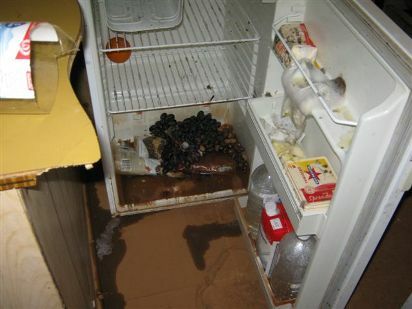 When disasters cause the power to go out, it generally means the food in your fridge will start to go off. Unless cold storage (below 4 °C) is available within 2 hours of a power cut, all potentially hazardous foods like cheese that are typically stored in the fridge need to be placed in alternative cold storage, eaten immediately or disposed of. Read more about guidelines on food safety and storage, particularly during a power cut. You should wash dishes that have been exposed to flood water in hot soapy water or in a dishwasher. Make sure the dishwasher is safe to use and has been thoroughly cleaned if it has been contaminated by dirty floodwater. Floodwater may have contaminated your vegetable or herb garden with bacteria, chemicals or other dangerous substances. Some vegetables may still be all right to eat. The Department of Health recommends disinfecting in hot water, peeling and cooking the produce to prevent food borne illness.